Written by Neil Sneade on 6 Jul 2018 in Tournaments. Last update on 5 Apr 2019. After the rollercoaster of emotions, the ups and downs, the celebrations and the heartaches, it’s all over. No, not England’s World Cup campaign, which for once is lasting longer than a bowl of strawberries at Wimbledon, but this years South Summer 7s mixed tournament. The evening opened with the Plate leaders, Queens’ Greatest Hits, taking on mid-table TTPish. A win would seal the title, anything else would leave QGH biting their nails on the result of Joe’s Love Island Rejects in the last match of the evening. 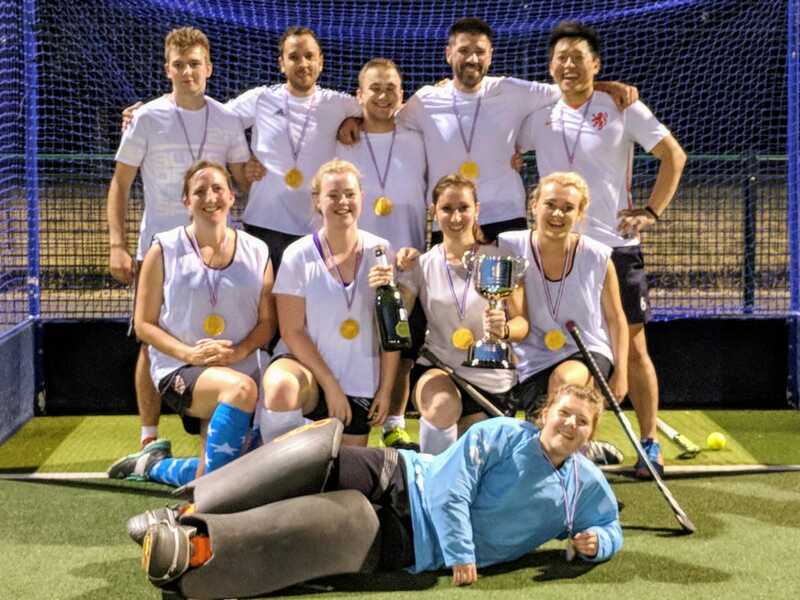 Generous-spirited as ever, Neil’s team selflessly extended the tournament excitement to the final game by losing 3-2 to Jan’s side, whose wildly-fluctuating personnel and form had them bring a strong line-up along this week. Damn them! 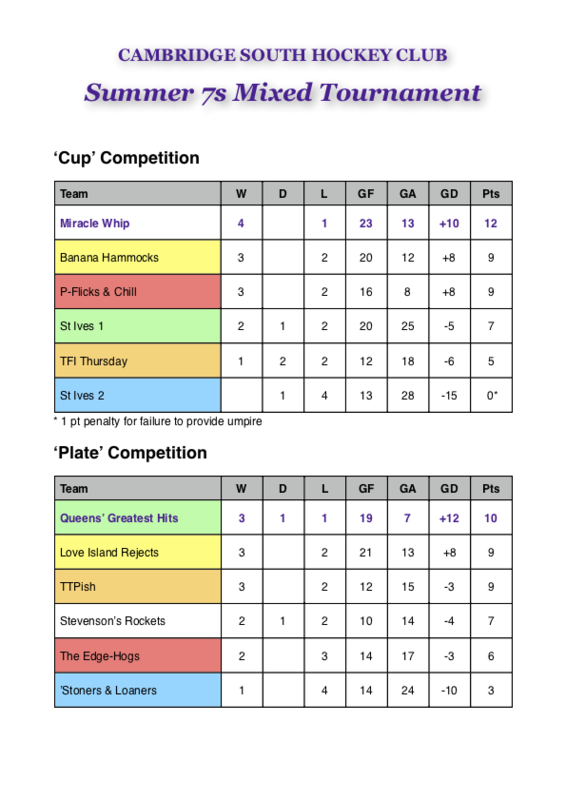 The 8.25 game then saw Laura’s red Edge-Hogs pick up their second win of the tournament and consign the ‘Stoners & Loaners to the wooden spoon position. Over in the Cup, Colin’s TFI Thursday played out an epic 6-6 draw with St Ives 1 before Harry’s P-Flicks & Chill saw off St Ives 2 3-0 to join Miracle Whip and Banana Hammocks on 9 points at the top of the table. With those two teams playing the final game though, one of them was guaranteed to take the title. And so both competitions came down to the final match on the final night. In the Plate, Love Island’s confidence was only slightly lessened by learning that Neil would be one of the umpires in their game…just one of those funny coincidences of scheduling! Confidence diminished further though when, despite missing a goalkeeper for the first 10 minutes and having only 6 players on the pitch, Stevenson’s Rockets stormed forward, pressuring the yellow D and ultimately taking the lead. Needing a win to take the title from QGH, Love Island pressed back and equalised after half time. The match was on a knife edge and the next goal would surely prove decisive; a resurgence from the whites saw them regain the lead before a late goal sealed a 3-1 win for Emily’s side. While the white team celebrated their victory, the remaining greens on the sidelines celebrated even more as their slender 1 point lead was preserved to claim the Plate trophy. So the question of which of QGH or Love Island Rejects would win their final game had been settled: neither of them! The Cup final, meanwhile, was proving even more epic. In a game that see-sawed back and forth, Amalia’s Miracle Whip found themselves behind and being overhauled at the top of the table by Robyn’s Banana Hammocks, with their cunning tactic to confuse their opponents by playing in blue instead of yellow this week (apparently as the midges love our fluoro-yellow bibs). Alice (the yellow/blue one) scored an absolute worldie, hitting a ball coming to her off the deck at high speed first time in the air to practically burst the net. It wasn’t enough though, as the white team turned it around to edge the match and the tournament with a 4-3 win. Which meant that, at the end of an evening of exciting hockey, all 12 teams stayed in exactly the same league positions as they’d started the night in! 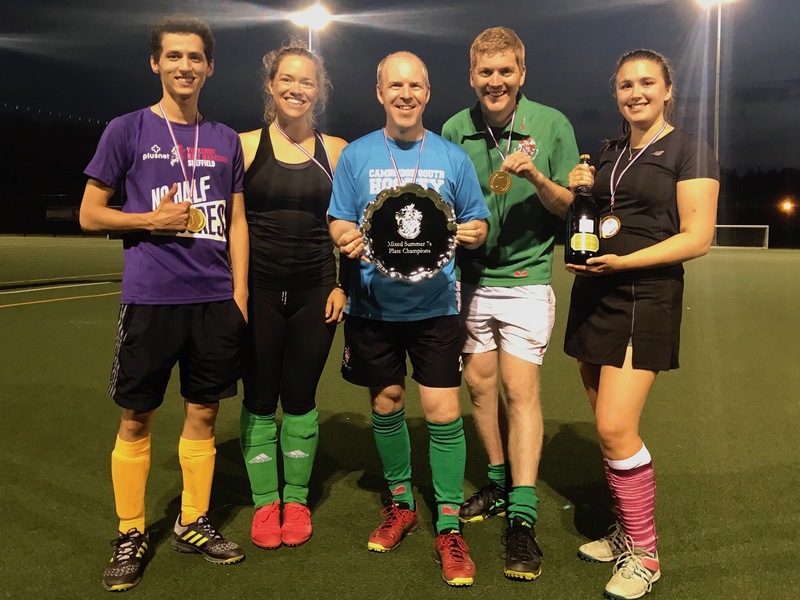 There only remained to hand out gold medals to all the players (chocolate and surprisingly unmelted) and present the trophies and magnums of bubbly to the winning captains, Amalia and…ahem…me! Fizz was sprayed, toasts were drunk from the cup - and the saucer - of victory and celebratory photos were taken, before the crowds dispersed after another great month of summer competition.